Make advanced guitar harmonies more intuitive and effective. This inventive approach to imagining and organizing notes will expand your concept of guitar harmony. You will be able to organize and use tensions more easily and with greater expression, whether you are soloing, playing in a rhythm section, or in a solo guitar context. Practical etudes over popular chord changes will help you to understand and apply these new theoretical concepts. The accompanying recording includes examples and play-along tracks, featuring innovative guitarists Mick Goodrick and Tim Miller, along with an all-star rhythm section featuring Terri Lyne Carrington on drums and John Lockwood on bass. 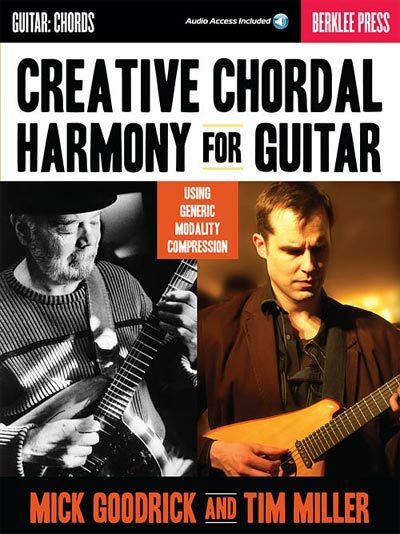 You will learn to: develop and apply new chord voicings, using a rich palette of notes; isolate and organize the most essential notes of any chord-scale (Generic Modality Compression); view chord scales as five families of 3-note chords: triads, sus4, clusters, 7th no 3, and 7th no 5), to be used systematically and simultaneously; leverage this chord-scale organization to lead you to inventive harmonies; incorporate tensions more intuitively into your comping and lead lines; and use new arpeggio patterns in linear improvisation. Audio files are accessed online for download or streaming using the unique code inside each book.